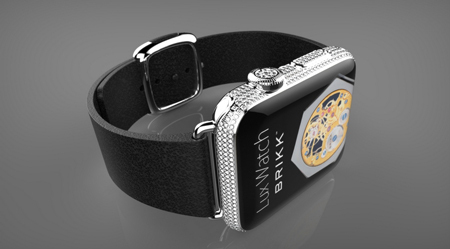 The Apple Smart Watch reaches a whole new level of luxury thanks to watch and phone designer Brikk. 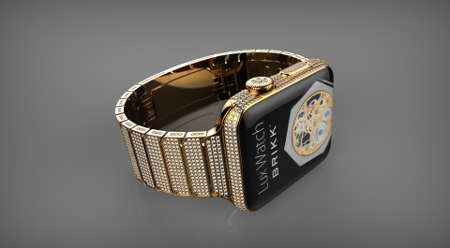 Their new collection includes 30 luxury models of the upcoming Apple Watch, which will afford unmatched opulence to an exclusive clientele worldwide. The Lux Watch is built in both 38mm and 42mm sizes and is available in 24-carat yellow gold, 18-carat pink gold, and 950 platinum. Customers have the ability to select from three different versions: The Standard, The Deluxe, and The Omni. The Lux Watch Standard offers a single row of diamonds totaling .50 carats around the face, and comes with a leather strap. 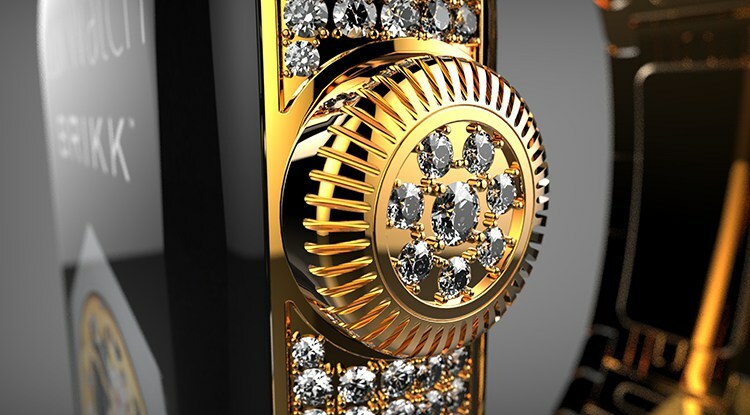 The Lux Watch Deluxe has 2.3 carats of diamonds in multiple rows around the face, diamond encrusted buttons, and a leather strap with diamond studded clasp. For the ultimate in exclusivity, the Lux Watch Omni has a fully diamond-wrapped case and band of over 12 carats of diamonds. 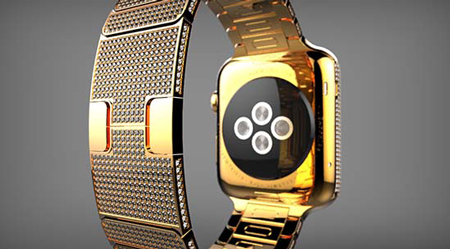 The Lux Watch line stands out thanks to its meticulous production processes. Each piece is disassembled inside Brikk’s state-of-the-art laboratory in Los Angeles by a team of skilled engineers. They are hand polished, then plated with five layers of diverse metals before their final plating in either two layers of gold or platinum. High quality diamonds (color D, clarity VVS1) are set with a microscope in a custom-machined bezel. Each piece is then reassembled and tested before shipping to clients Prices range from $7,495 for the Lux Watch Standard, to $11,995 for the Lux Watch Deluxe, to $69,995 for the Lux Watch Omni. All models are packaged in a Zero Halliburton aluminum case with carbon fiber interior. Each Lux Watch also comes with all standard accessories, a user manual, a diamond-embedded certificate of authenticity, and an exclusive 1-year warranty. Brikk is taking pre-orders for the first batch of watches before the expected official launch of the Apple Watch in April. A deposit is required for each pre-order. 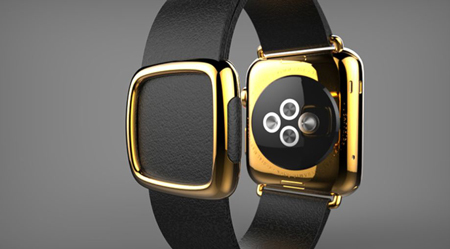 The pre-order Lux Watches are expected to ship out 4-6 weeks after the official release of the Apple Watch. Have you ever considered about including a little bit more than just your articles? I mean, what you say is important and all. But just imagine if you added some great pictures or videos to give your posts more, “pop”! Your content is excellent but with images and video clips, this site could undeniably be one of the very best in its niche. Wonderful blog! 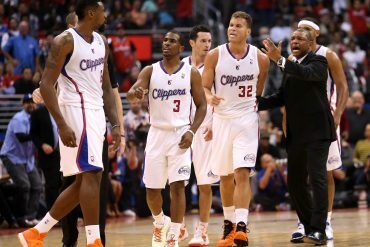 That is the proper blog for anyone who wants to seek out out about this topic. You notice so much its almost hard to argue with you (not that I truly would want…HaHa). You undoubtedly put a brand new spin on a subject thats been written about for years. Great stuff, simply great! With almost everything that seems to be developing inside this specific area, your viewpoints are generally relatively radical. Nonetheless, I beg your pardon, because I can not subscribe to your whole idea, all be it exciting none the less. It looks to us that your comments are actually not entirely validated and in fact you are your self not really wholly convinced of the argument. In any event I did take pleasure in examining it. I enjoy you because of all of the work on this site. Kim delights in participating in investigations and it is obvious why. Most people notice all regarding the powerful medium you produce great secrets on your web site and even invigorate participation from visitors on the situation then our simple princess is always discovering a whole lot. Take pleasure in the remaining portion of the new year. You have been performing a dazzling job. I’ve read some good stuff here. Certainly price bookmarking for revisiting. I wonder how a lot attempt you set to make any such magnificent informative website. Throughout the grand design of things you actually receive an A+ just for effort and hard work. Where you misplaced me was first on all the details. As people say, details make or break the argument.. And it couldn’t be more correct at this point. Having said that, permit me tell you what exactly did work. Your authoring is really powerful which is most likely why I am making the effort in order to comment. I do not make it a regular habit of doing that. Second, whilst I can certainly notice the jumps in reason you come up with, I am not really convinced of just how you appear to unite your points which in turn make the final result. For right now I will yield to your position however wish in the foreseeable future you connect the facts much better. I am really enjoying the theme/design of your blog. Do you ever run into any internet browser compatibility problems? A couple of my blog readers have complained about my blog not working correctly in Explorer but looks great in Chrome. Do you have any tips to help fix this issue? I used to be very happy to seek out this web-site.I wished to thanks on your time for this excellent learn!! I definitely enjoying each little little bit of it and I have you bookmarked to check out new stuff you weblog post. That is very attention-grabbing, You are an excessively skilled blogger. I’ve joined your feed and look ahead to in quest of more of your magnificent post. Additionally, I have shared your web site in my social networks! I have read some good stuff here. Definitely value bookmarking for revisiting. I wonder how a lot attempt you put to make the sort of fantastic informative site. The ending hints at a sequel! Oh joy… So this well-made but extremely shallow film is bogged down even more by an extremely UN-original screenplay and heartless direction, and that’s sad. I’m no longer sure the place you are getting your info, however good topic. I needs to spend some time finding out more or understanding more. Thank you for fantastic information I used to be searching for this info for my mission.